Cornelian cherry or cornus mas is a type of dogwood that is “nearly native”, as this deciduous shrub has been grown in the UK for centuries. It originates from central and southern Europe as well as western Asia (Caucasus), where it is often planted for its dark red to blackish berries that are great for jams and jellies, also not uncommon in the UK. The edible berries have a cherry-like taste and are slightly acidic, which is why they are more suitable as an ingredient than to eat directly. Cornelian cherry is an excellent choice for informal wildlife-friendly hedges, providing food to both insects and birds when they need it. It can be planted along with other deciduous shrubs with high wildlife value in a mixed country hedge. In addition, it is frequently used as a ground cover in difficult positions. Cornelian cherry can also be useful in smaller gardens, providing it is pruned at least once a year, preferably in June-July at the latest, or the branches will become inconveniently woody. Cornelian cherry is a very twiggy, densely branched shrub, easily grown in most soils and positions. Although it is undemanding, it is happiest growing in a moist, alkaline, well-drained and preferably fertile soil. Cornus mas is at its best in February, when the brilliant yellow flowers borne in clusters decorate the bare stems. The greenish leaves appear after the flowers and turn to red-purple in autumn. 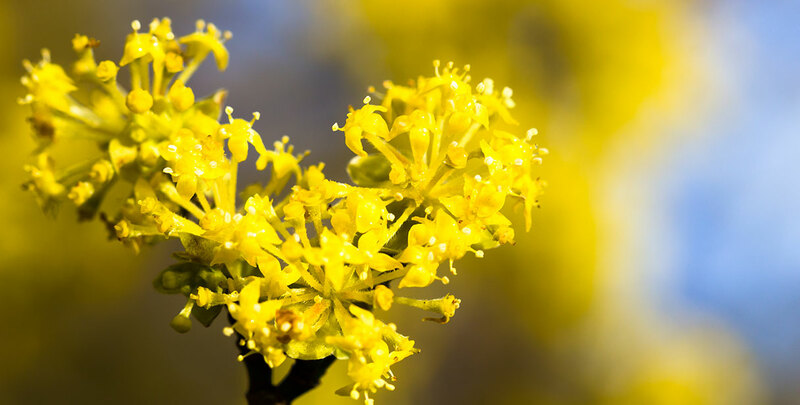 Cornelian cherry benefits from being planted in a site that receives – direct – sunlight most of the day, but it can also cope well with shady sites. Cornus mas will grow an average of 20-40cm a year, reaching a final height of approximately 6m if unpruned. This appealing shrub has a spreading habit and is hardy down to -20C, which is more than enough for most UK winters.